Welcome to POTF Coin for Sale Thread! In November 2008, I started on a crazy mission of collecting the entire set of 62 POTF vintage coins. I also had a go at some of the more rarer alternative backs and prototypes as well as the Droids and Ewoks coins. Its Feb 2014 now and I managed to get to 56 out of the 62. So I never quite made it, but I did had awesome fun along the way. via some of the most repsected collectors of our community. Its going to take me a while to post every coin up. So if you have interest in a specific coin let me know and I get that up too. Prices are in line with what I am hoping to get and current market trends. I will consider offers but please note I am hoping to get as much as I can as me and the wife want a family of our own. Delivery will be by Royal Mail Next Day Registered Delivery & Fully Tracked & Insured. Outside UK I will look for a similiar service. All items will be packed bullet proof, If you order more than one coin I will pack individually but post together in a larger box. Buyer pays for delivery and boxes/envelopes etc. I will ship your item the same day you pay, unless you pay after the post office closes in which case the package will be shipped the next working day that the PO is open. You will be emailed a photo of the registered delivery receipt showing your tracking number and the address it is being sent to. I will only be accepting "paypal gift" or "payment owed". This is to protect me once the coins are sent as I will have no way of getting them back once they are posted if a buyer attempted to reverse a payment. Any other payment types will be rejected and returned to seller. Please look at all photos carefully before buying - I will answer any questions honestly, I will try to point out any flaws, but everyone has a different appreciation. I will not except returns, which is why I have gone through all the effort to describe and photograph the coins. One of the very first coins I picked up. It much smaller than the normal X-wing with a different back as seen in the photo. A really nice coin. This a prototype test coin for the 63rd Gold Anodised POTF coin that was to be a premium for the never produced mail-away coin album. I bought this from Brian's Toys AFA Graded, but opened it up for displaying in my coin album. The coin is in really nice condition for a prototype. There a very faint but really straight line on the coin. I'm not sure what this is. Look at the photo of the coin on the scale under the word pilot you will see the faint line. It's not a gouge, but may from the original kenner owner or from the anodising testing process. As I said this is a really nice coin - Remember these prototype coins would be passed around from Kenner departments and were not meant at the time to be collectors items so most of the ones I seen have wear in some shape or form. I need to double check my records but I am sure the AFA grade was 85, so that might help in determining condition. This is an "alternative back" prototype of the standard a-wing coin. A really nice Ex-Kenner Employee POTF prototype coin. 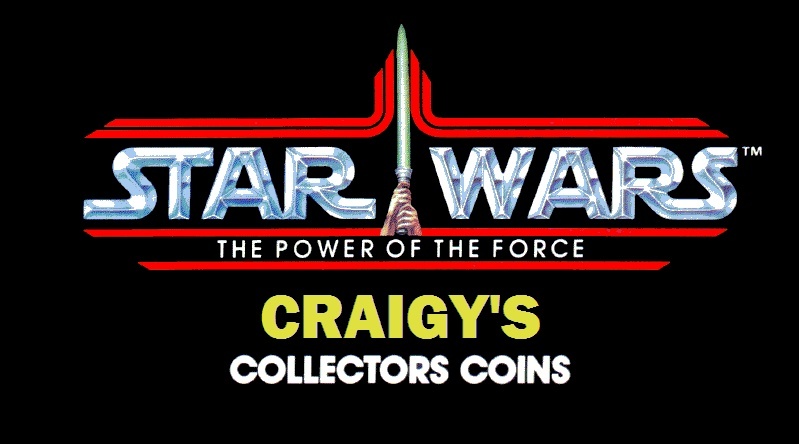 Note the back of the coin has been updated with the POTF logo rather than the original SW. There are several alternative coins available, but in 5 years I only got a chance at scoring one. This one came from Todd Chamberland. This coin was actually bought graded (UKG 85). I wasn't interested in the grading just the coin so opened the case. The coin is in really good shape as can bee seen in the photos. Weight of coin shown to confirm this is not a reproduction. This Ex-Kenner coin was sourced from Gus Lopez. A really nice example of a popular coin. Lots of collector who try to get just the Cat 1 to Cat 3 coins often find this one a tough one to pick-up. I will enclose a copy of Gus's letter indicating provenance to an Ex-Kenner source signed by me to continue the history. Weight of coin shown to confirm this is not a reproduction. A really nice Ex-Kenner coin. Photos are below pictures speak for themselves. Click on thumbnails to en-large. I can't really fault this coin but please view every picture first to make sure you are happy before buying. Weight of coin shown to confirm this is not a reproduction. This coin was originally sourced from the collection of an Ex-Kenner Employee and sold on to me through James Boryla (SWSeller.com). A really nice Ex-Kenner coin sourced from SWSeller. This coin was originally sourced from the collection of an Ex-Kenner Employee and sold on to me through James Boryla (SWSeller.com). Click on thumbnails to en-large, the photos supplied are for the exact coin you will receive and the condition. Weight of coin shown to confirm this is not a reproduction. Coin has no major dents or scratches, but is there some tarnishing above the logo it only noticable in certain conditons. I have not attempted to clean this and I only point this out as I want you to be fully happy with the coin. Since being in my collection it has been stored carefully in a coin album. Weight of coin shown to confirm this is not a reproduction. A really Nice Ex-Kenner coin sourced from Jedi Toy Land. Photos below. Click on thumbnails to en-large. I can't really fault this coin but please view every picture first to make sure your happy before buying. The photos supplied is for the exact coin you will receive and the condition. Weight of coin shown to confirm this is not a reproduction. This Ex-Kenner coin was sourced from Gus Lopez. A really nice example of a popular coin with minimal wear. Please see photos to confirm condition. I will enclose a copy of Gus's letter indicating provenance to an Ex-Kenner source signed by me to continue the history. Weight of coin shown to confirm this is not a reproduction. The Holy Grail! This Ex-Kenner coin was sourced from Gus Lopez. A really nice example of the most hardest coin out the 62 to source. Front of coin is perfect. Reverse of coin has a very thin scratch, to the right of the text. In all fairness, this coin exists in fewer examples than some prototypes. Please see photos to confirm condition. I will enclose the original copy of Gus's letter indicating provenance to an Ex-Kenner source and a signed note by me to continue the history. Weight of coin shown to confirm this is not a reproduction. A really Nice Ex-Kenner coin sourced from Wormhole Collectables. Photos below. Click on thumbnails to en-large. One of the first HTF coins that I picked up from SWSeller. The coin was a part of a huge stash that was purchased from an Ex-Kenner Employee by SWSeller. A nice coin. See photos below. Hi Craig, PM sent mate and good luck with the sales! For those who don't know Craig, he's a top guy and collector so don't hesitate to deal with him. I wish you the best for the sales man!! Guys....get in the row! A true gentleman is preparing for a monster sale!! Good luck with the sales, Craig. I hope to pick up one or two of your coins. Will watch your updates with keen interest here. I've sent you a PM with the handful left I'm looking for. I will respond to everyone's PM's shortly... I will post the coins that people have expressed interest in up too. All PM's replied to and more photos and coin prices added. Sail Skiff & Luke Hoth coins have been sold. Sold coins updated in listing. Coins are going much faster than I expected. Cheers Guys for publicising on other platforms for me. Received my coin today, very happy. Good luck with the rest of the sales. I still have a few CAT V and CAT IV left, and a complete set of CAT III.